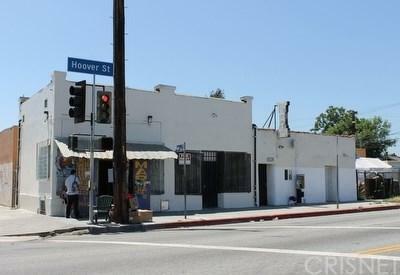 This property is located in the corner of 68th street and Hoover street. It is a densely populated area. It has 4 unit retail space. Market pays $850 a month; Tattoo Shop occupies 2 units, Pays $1400 a month; Mini mart pays $750 a month; Unused lot used by Towing company, pay $500 a month; Total monthly Rent collected $3500 a month. Also Lamar advertising pays for monument sign $700 a year. Tenants pay all utilities. No other maintenance expenses. Tax record shows building sqft 1,239. But estimated it has 1,600 sqft.BUYER CAN ASSUME LOAN OF $297,000, MONTHLY PAYMENT IS $1,812. NO CREDIT CHECK OR INCOME VERIFICATION REQUIRED. DO NOT PASS THIS OPPORTUNITY OF LIFE TIME. PUT DOWN $103,000 AND CLOSE ESCROW.